Howtoons is a comic that taps into kids' imagination and curiosity with DIY science projects. It behooves them to offer new books in that series then, which is exactly what they're doing with Howtoons: [Re]Ignition. Created by MacArthur “Genius Grant” Fellow Dr. Saul Griffith and Eisner-Award-nominated comic book artist Nick Dragotta, Howtoons celebrated its 10th anniversary with Tools of Mass Constuction in July 2014. Howtoons: [Re]Ignition uses the Howtoons model — incorporating fun science projects into stories — in a post-apocalyptic adventure story written by Fred Van Lente and with art by Tom Fowler and Eisner-winning colorist Jordie Bellaire. In this February graphic novel from Image Comics, Celine and Tucker are siblings who wake up in the far future, where energy is scarce and their parents are missing! They explore a strange new Earth using their gadgeteering skills to create projects and experiments to survive hostile tribes and bizarre mechanized threats — projects and experiments kids and parents can make themselves at home, and learn basic energy literacy at the same time. 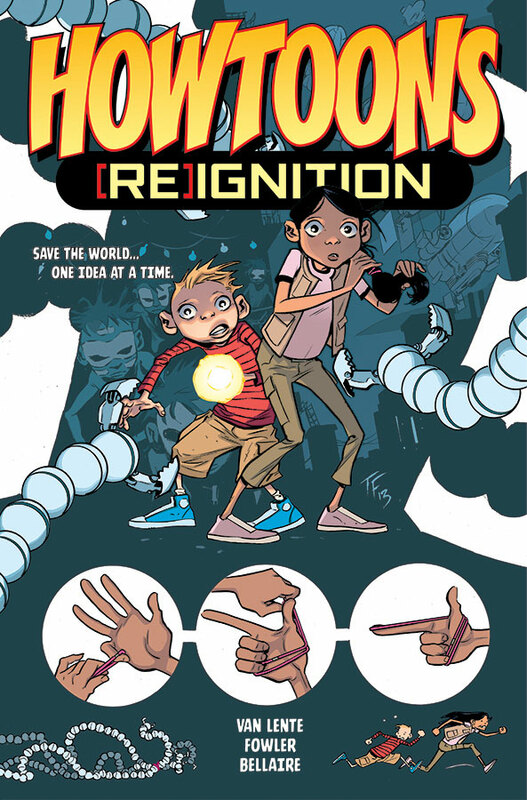 Howtoons: [Re]Ignition, is perfect for kids from ages 8 to 12 and a must-have graphic novel for every classroom. It will be in comic book stores on February 25(DEC140668) and in bookstores on March 10 (ISBN 978-1-63215-056-1). Full press release below. Created by MacArthur “Genius Grant” Fellow Dr. Saul Griffith and Eisner-Award-nominated comic book artist Nick Dragotta, HOWTOONS celebrated its 10th anniversary with TOOLS OF MASS CONSTRUCTION in July 2014. RE [IGNITION] uses the HOWTOONS model — incorporating fun science projects into stories — in a post-apocalyptic adventure story written by Fred Van Lente (Action Philosophers, Archer and Armstrong) with art by Tom Fowler (Quantum and Woody) and Eisner-winning colorist Jordie Bellaire. In HOWTOONS there is something to interest every kid who picks it up, Dragotta explained, whether they’re into art, stories, design, or engineering. “If the book serves as any kind of primer to opening a reader up to something new, I’m all for it,” he said. Melding science, technology, engineering, art, and mathematics (STEAM), HOWTOONS: RE [IGNITION], is perfect for kids from ages 8 to 12 and a must-have graphic novel for every classroom. It will be in comic book stores on February 25 and in bookstores on March 10. Specially priced at $9.99, HOWTOONS: [RE]: IGNITION is available for pre-order now.